How do you supply power to your RV? Plugging into a park pedestal may be something you do without thinking. Perhaps you go a more trusted route with your own generator. 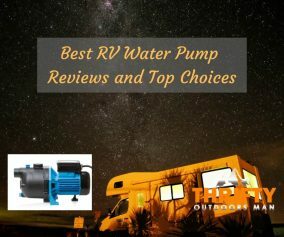 Maybe you’ve grown tired of hearing the loudness of your rv generator instead of the soft cricket sounds at that remote campsite you love so much, and you’ve decided to go green! Using solar panels is an excellent way to supply power to your RV. 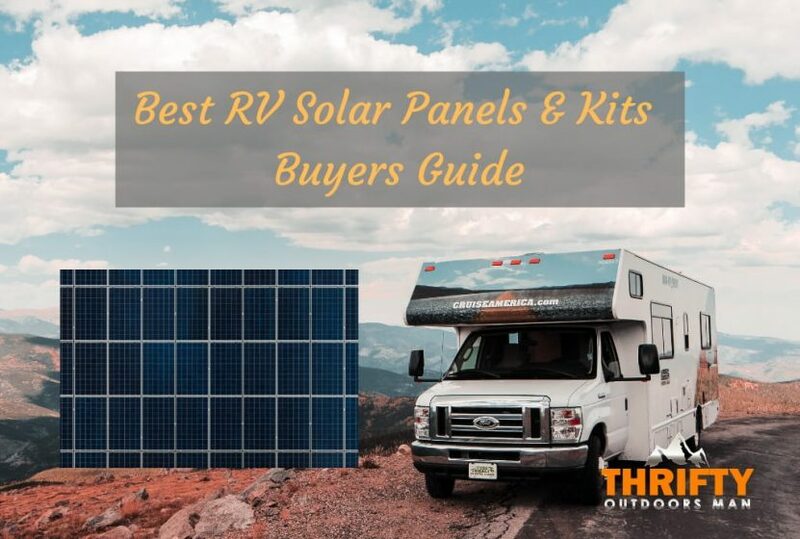 In this Buyer’s Guide, I’ll give you an overview of 5 of the best RV solar panels and kits available in today’s market. Solar panels give you the freedom to camp anywhere and provide you with an economical and efficient power supply. With solar panels, you’re no longer restricted to parks that provide you with electric hookups. You can go to a remote, off-grid campsite as far away as you wish! To learn more about what it means to be off-grid, click here. Using the sun’s energy, the solar panels give you the luxuries you’ve come to depend on from shore power. 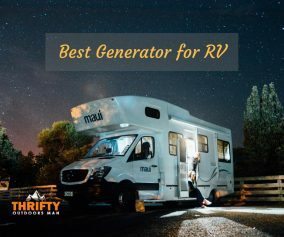 It’s recommended to park your RV or place your portable panels in as much full sunlight as possible in order to ensure you get optimal amount of power. Click here to learn how conserving energy with solar panels protects the environment. Solar panels are safer than plugging your RV’s electrical system into a park hookup that has potential miswiring or inconsistent voltage fluctuations. In addition to it being safer, solar panels give you the power you need for comfortable camping--without a sound! You don’t have to be the annoying neighbour with that loud generator anymore. With solar power, you eliminate the hum that disturbs the environment and you get to enjoy more of the wildlife around you. Check out the video below for a quick overview of how to install a solar panel system on your RV and enjoy the freedom of going off-grid. If you’re like me before I knew much about solar panels, you may think that they’re all the same. Yes--they do all gather energy from the sun, but there are definite differences that make each panel its unique product. RV users can choose a portable solar panel which stands alone at an angle. These are easy to carry, move around, and store. Their easy setup makes them a great choice even for tent campers. Another solar panel bends up to a 30 degree angle. With this flexible feature, users can bend the panels to gather as much direct sunlight as possible. The amps and watt-hours of the solar panels are likely the most important differences to consider. Depending on the amount of appliances and phone chargers, or lights and fans that need to be powered up determines whether you’d choose a solar panel with a 10-, 20-, or 30-amp charge controller. The WindyNation-100W Solar Panel Kit includes (1)100W Solar Panel, (1)20-amp P20L LCD display solar charge controller, 40 feet of UL listed 12 AWG solar cable, (1 pair) MC4 connectors, (1)100 amp-hour AGM deep cycle 12 volt BattaMax battery, and (4 sets) solar panel mounting brackets and fasteners. This 20-amp charge controller can handle up to 3 100W-panels which equals to a 12-volt system. Depending on sunlight exposure, one panel can provide an average of 350 watt-hours or 33 amp-hours each day. With the user-adjustable PMW solar charge controller with a digital LCD screen, users can easily see the solar panel and battery charge status, the voltage, and the direct current (DC) load draw. This 90-lb solar panel weathers extremely cold temperatures and severe thunderstorms. It can power a 5k AC unit with an additional battery and full sunlight. The Acopower Foldable Solar Panel Kit includes (2) pieces of foldable 50W Grade A monocrystalline solar panels and (1) 10-amp charge controller. This portable kit is easy to carry and comes with a protective suitcase. It features pre-installed stands that set up within 1 minute. No mounting brackets are needed for this unit. The angle of the stands can be adjusted in order to get the most sunlight as possible. The frame is made of corrosion-resistant aluminum, giving it the solid, lightweight structure. This kit features protective corners to reinforce its durability. It comes with a pre-installed 10-amp charge controller, and it’s prewired for a 12-volt battery. It runs lights, fans, chargers, phones, and more. Even in low light, this 33-lb Acopower boasts high performance. For best results, this solar panel should be set up facing the sun. The HQST 100W Polycrystalline Solar Panel Kit includes (1) 100W 12V polycrystalline solar panel, (1) 30-amp PWM LCD charge controller, (1 pair) 20ft 12 AWG adaptor cables, (1 set) Z-Brackets and all necessary mounting hardware. Depending on the amount of sunlight available, this unit can provide an average of 500 watt-hours per day. This system can be expanded up to 400 watts and 24 volts. This light 19-lb solar panel can fully charge a 50 amp-hour battery from 50% in just 3 hours. This solar panel comes with pre-drilled holes, making mounting an easy task. It provides a 12V system excellent for RV’s, trailers, boats, and off-grid cabins. The Renogy Kit-RV400D Solar Panel Kit includes (4) 100W 12V solar panels, (1) 30-amp PMW Flush Mount Charge Controller, 30ft-10 AWG MC4 adaptor kit, 16ft-10 AWG tray cable, (3 pairs) branch connectors, (4 sets) Z-Brackets for mounting. This 88-lb, 12V RV kit has a monocrystalline solar cell efficiency of 18.4% which charges a battery with high efficiency. 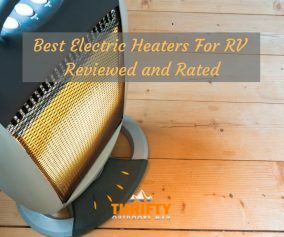 It can power the electricity (including an oven) needed in an RV. It can charge 4 6V-batteries and a 2k watt inverter with ease. The corrosion-resistant aluminum frames of these panels are designed to withstand high winds and heavy snow loads. This system features a UV-resistant, waterproof cable entry housing which installs smoothly on any roof. The Allpowers Solar Panel Module includes (1) 100W bendable SunPower solar panel, (1) Instruction Manual, and 18-month guarantee. This 4.7-lb SunPower solar panel may be light, but it’s powerful. The solar panel cell boasts up to 23.5% efficiency. Without a charge controller, you run the possibility of overcharging your batteries. This panel can power a refrigerator, shower, and even a car sound system. This water-resistant unit features a semi-flexible panel that arches up to 30 degrees. The panel has 4 metal reinforced mounting holes that make it easy to install on your RV, boat, cabin, or any other irregular surface. The bent panels can potentially collect more solar energy; however, if moved too often, they can become brittle. If you’re looking to use the solar panel to power up just a few of your necessities, you may want to consider the Acopower Foldable Solar Panel Kit. Because it’s portable, you can place it in the sun’s tracks to gain as much energy as possible. If you’re looking for something more permanent that provides a higher amount of energy, you could consider the HQST 100W Polycrystalline Solar Panel Kit. At a decent price, the 30-amp charge controller will provide you with an average of 500 watt-hours per day. The pre-drilled holes are designed to make the mounting process a breeze. If your budget allows for a full, well-rounded system, I recommend the Renogy Kit-RV400D Solar Panel Kit. With these 4 panels you’ll receive enough clean power to supply most of your RV needs.